As an author, speaker, trainer and consultant, Frank understands the importance of communicating the complicated. He helps clients explain their hard-to-grasp ideas and turn concepts that baffle into comprehensible ideas bosses, regulators and investors embrace. He works with engineers, scientists, economists, lawyers and other smart people helping them mold their ideas into something non-specialists can comprehend. He’s been “translating” for the technology elite for over 20 years. Frank discovered he had a talent for making complex topics easier to understand when organizing industry conferences on telecommunications, cyber security, mining and financial services in the United States, Chile and Brazil. At A.T. Kearney and at The Launch Company, a public relations agency for high-tech start-ups, he honed his skills in de-geeking specialized topics and garnering media attention. He started his own company, Definitive Communications, working with clients such as George Washington University’s Creative and Innovative Economy Center, the International Intellectual Property Institute, The Hartford and NASA’s Ames Research Center. 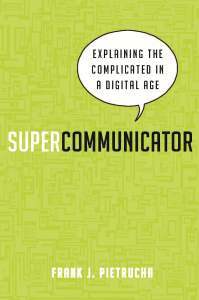 The author of Washington Post bestseller Supercommunicator: Explaining the Complicated so Anyone can Understand, Frank appreciates the significance of a changing communication landscape. He coined the term “supercommunicator” to describe a new breed of forward-thinking professional who can apply classic content development skills to a rapidly evolving era of new communication styles. He helps clients explain their complicated concepts and trains people on the critical skills of communications, presentation and visual design, and storytelling. Frank earned a Bachelor of Arts degree from Cornell University. Additionally, he has completed coursework at Universidad Iberoamericano in Mexico, University of Bath in England and the School of Visual Arts.